The Gran Teatre del Liceu, epicentre of opera, ballet and classical music in Barcelona since it opened in the mid 19th century, has played host to the best composers, musicians and singers through the ages. It is considered to be one of the best opera houses in Europe, where art and elegance are brought to the stage every evening. In the heart of the Rambla there is one of the oldest, most historical theatres in Barcelona: the Gran Teatre del Liceu. The quality of the opera and dance productions performed there, as well as the classical music concerts, make it one of the most renowned theatres in the world. In the mid 19th century, distinguished members of Barcelona's bourgeoisie decided there was a need to build a theatre befitting the importance the city was acquiring at a time of economic and cultural expansion, and this led to the construction of the Liceu in 1847, on the site previously occupied by the Convent dels Trinitaris Descalços on the Rambla. The first building was based on plans drawn up by architect Miquel Garriga i Roca with the help of Josep Oriol Mestres. The first serious fire to affect the building occurred in 1861, but it was restored and rose from the ashes as a great opera house. More than a century later, in 1994, the theatre succumbed to another serious fire. The building was faithfully reconstructed but the theatre was given a much more modern technical structure and was also extended. As a symbol of culture and distinction in the city, the Liceu offers a programme that includes eternal classics such as Verdi, Mozart and Wagner alongside new and original concepts such as the contemporary jazz opera Porgy Bess by George Gershwin. The Liceu is also becoming increasingly committed to education in Catalonia and has established the Petit Liceu, a programme of music and arts designed to help young children develop their musical and creative sensibilities from a young age. When we think of Barcelona, it is impossible not to think of the Rambla and the Liceu and, as a cultural symbol within the city, it is a benchmark that everyone should pay a visit to. 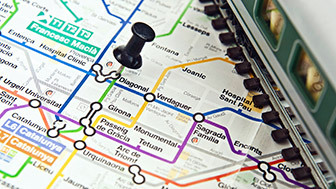 The Liceu forms part of the Raval Cultural project, an initiative that aims to provide everyone with access to the neighbourhood's artistic and cultural heritage. 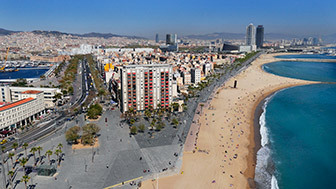 Barceloneta is home to one of the city's most popular and iconic beaches. 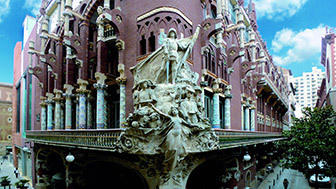 The Palau de la Música is a privileged setting and a symbol of the city.